Sometimes I swear that parenting a child feels like you are on a roller coaster. No. It does feel like you are on a roller coaster. It's super fun, scary, and a whole bunch of other feelings all wrapped into one crazy ride. It also goes by WAY too fast. I really think that Bug is much like his momma in many ways. He sees something he can't do, gets mad and does it. He did this with sitting. He saw a friend sitting and bam! He started sitting. We went to a play date where everyone was crawling and the next day he is crawling. He is learning new skills all the time. Some of them scare me to no end! 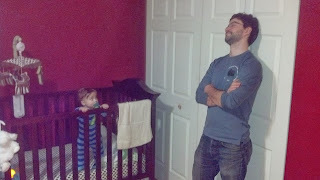 Sunday night we put Bug to bed like normal. He cried for a minute of two, but then got quiet. We don't let him cry it out, but do let him alone for a few minutes if he is only fussing. It seemed to be a normal night. His daddy and I went back out to the couch for Happy Hour (that hour between him going to bed and when we go to bed) and about ten minutes later we heard the most horrific scream that I have ever heard in my entire life. His dad and I both fell trying to run to the bedroom. 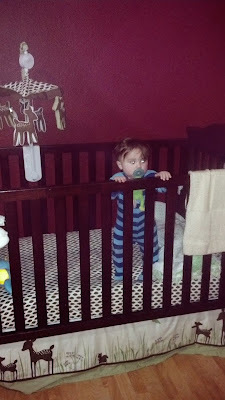 I screamed out that he fell out of bed (further shortening my husband's life span) and we both ran into the room. He (thank you God) did not fall out of bed. He did however fall INTO bed. 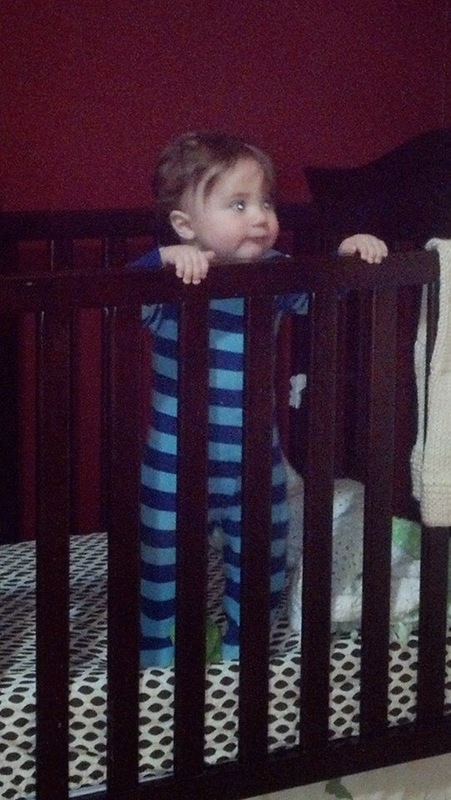 The little bugger has figured out how to pull himself up in his crib. This is a new skill. He must have lost his balance and bit it into his crib and bumping his head. He is pretty proud of himself now. 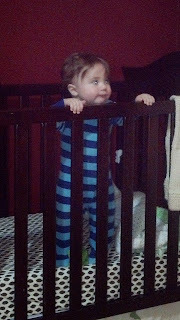 Anytime he is on the ground he is now trying to pull himself up on ANYTHING. How did he get so big so fast? I remember him being little, but barely. I now understand why women love babies, especially if they have kids of their own. Because they are babies for .9 seconds and that is it, BAM, no longer babies. In all honesty, everyone that I have met in Fairbanks is SUPER nice. I'm sure that now that I have written this, mean people will emerge, but I'm hoping that is just a few! So, take a few seconds and do something nice for someone else. 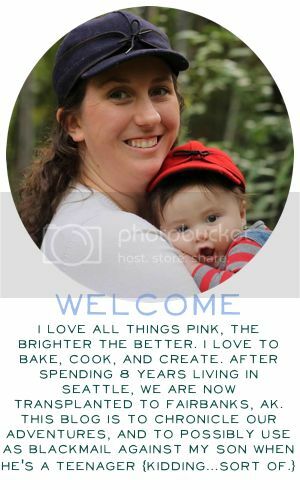 Share Sunday's post on FB, Twitter (I have an account...ask me if I know how to use it!) or your preferred social media venue. Send me your good things my way! Thank you for that!